Too much stuff in the basement, and no more room in the garage? Consider creating some brand new storage spaces outdoors that complement your home. 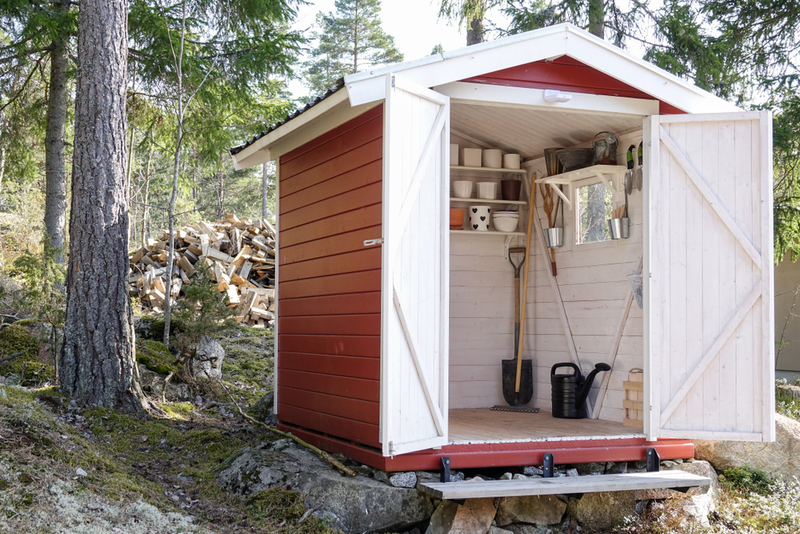 Skip the sheds from the big box stores and have storage designed with one person in mind: you. If you’ve lived in your home long enough to fill the garage and the basement, chances are your first step is evaluation. Make three piles: keep, donate, and discard. It’s an unwelcome task, but getting this part out of the way upfront means you’ll be keeping what you really want, and finding it when you need it. Once you’re finished here, you’ll be better prepared to choose the right outdoor storage for you. Channel surf any day of the week and you’ll find plenty of programming devoted to tiny living, but think about it from a different angle. Going tiny for outdoor storage means building a structure to complement your house. The design and colors can mimic your original home, creating a charming design element that is functional and beautiful. Consult with a professional to see how you can work together. Familiar with building codes and setbacks, an experienced contractor can start you off on the right foot from the very beginning. Storage doesn’t have to be noticeable. Consider built-in seating on your deck or patio that is designed to multitask. Seating storage is a great place to stow cushions on rainy days, and kids’ toys everyday. The front porch offers additional opportunities for seating storage, and even some hidden, upright storage to handle brooms, shovels, and muddy boots. Utilizing the space within otherwise functional designs provides two-fold value. The result: uncluttered and beautiful. If you have a raised deck and open space beneath, consider having the space repurposed to provide storage. While it’s true you can always just tuck extras under the deck, have a professional evaluate and design an enclosed space where you can safely store your treasures without worrying about the weather, or the local wildlife. As a bonus, the enclosed area will be wonderfully carefree as you’ll no longer need to worry about weeds, dirt, and clutter. As the weather warms up, we’re spending more and more time outdoors. Given all the time and energy we spend on our homes, why not consider adding a few outdoor storage options? Beautiful, functional storage is possible. Just think of the possibilities!